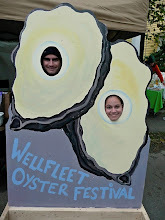 We love checking our email and seeing a request for us to sample oysters or oyster related products. Not too long ago, we received a request from Loftin Oysters. They wanted us to sample their shells. Yes, their shells - no oysters, just shells. We were intrigued. A quick look at www.loftinoysters.com shed some clarity on the request. Loftin makes beautiful stoneware that looks like an oyster shell - a perfect product for cooking and displaying your oysters. A few days later we received a shipment of shells. 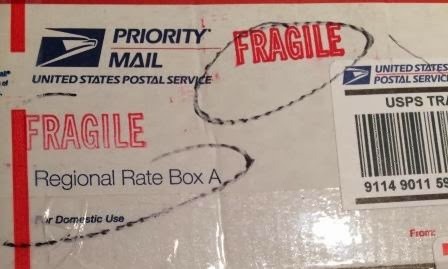 Carefully and artfully packed, our shells arrived in a beautiful bag. Each Loftin shell is hand-crafted, asymmetric and unique - just like a fresh oyster's shell. Then we had fun decorating each oyster with some of our favorite baking items: cheese, spinach, a dollop of sriracha, and a squirt of lemon. We let them bake for about 8 minutes on 350 degrees. After a few minutes of cooling time, delish! The oyster shell stoneware also works great as a serving piece for other seafood related items. 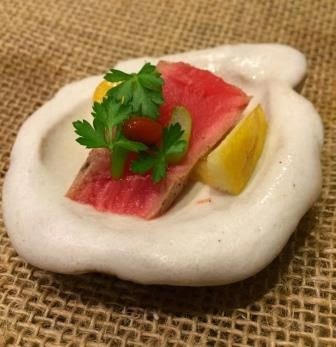 Tonight we had some raw tuna so we used the stoneware to showcase our appetizer that contained a slice of raw tuna, scallion, lemon wedge, and a hit of hot sauce. The stoneware is prefect for all your seafood amuse bouche recipes. The stoneware adds a nice decorative feature to the oysters. Perfect for a party or dinner with guests. After all, food that looks great tastes that much better! Cleaning was as simple as rinsing them off with a soapy sponge and then letting them dry overnight. Overall we really enjoyed using the oyster shell stoneware for the first time. When the weather warms here, we will try them on the grill. We are excited to get many uses out of these gems and show off our baked or grilled oysters in our new decorative stoneware. Get yours today online here. 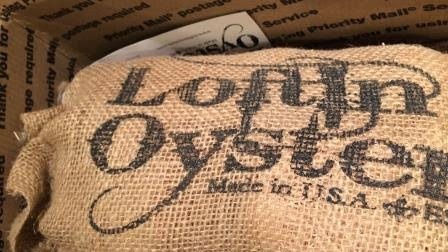 In the notes section of your order enter "GSAO" (for "Go Shuck An Oyster") and you'll receive 10% off AND, if you order 2 bags you'll receive free shipping! That's a savings of $6 or $22 from your friends at Go Shuck An Oyster. Know someone who likes oysters? 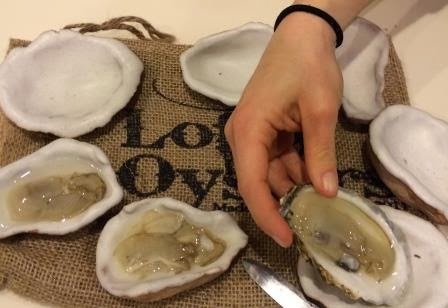 Oyster Shell Stoneware from Loftin Oysters makes a great gift too!